Hawksmoor Spitalfields Bar: Cocktails with Lobster Rolls and Shortrib Nuggets anyone? The cocktail list is a mix-‘n’match of timeless classics (each with it’s own twist) as well as a monthly-changing guestlist of ‘Desert Island drinks’ – a compilation of Hawksmoor bartenders’ personal favourites. I’m usually a little bit hit-and-miss with cocktails, but boy did I have have a real moment with the Eureka from the very first sip. Fresh, zingy with a proper right hook from a big slug of sloe gin, it was so fabulous I found myself ordering a second in no time. The tangy, bitter-sweet Ginger Brew concoction which Jo opted for on the other hand was a little too strange for my anti ginger taste buds. Bring on the food… and within 5 minutes of our cocktails arriving, we soon found ourselves swamped with so many dishes our little round bar table could barely cope. Side dishes first. And if there is one that deserves to be promoted from the bench up to the starting line-up of burgers, dogs and other big boys it would have to be the Short Rib Nuggets. Large chunks of ultra tender melt-in-the mouth short-rib, deep-fried in a wonderfully crisp panko-style batter, it’s one of those snacks that will have me waking up at 4am in the morning in a panicked hunger pang stake thinking about it. Pure gold. What makes the nuggets even better though is the glorious Kim Chi ketchup dip. Sweet, tangy and fierily spicy, it cuts through and complements the richness of the beef rib wonderfully. I WANT MORE. With it’s roots from Laos, the Tamworth Laab was an unexpected find on a menu which was otherwise dominated by British-American bar food. And what a joy it was. 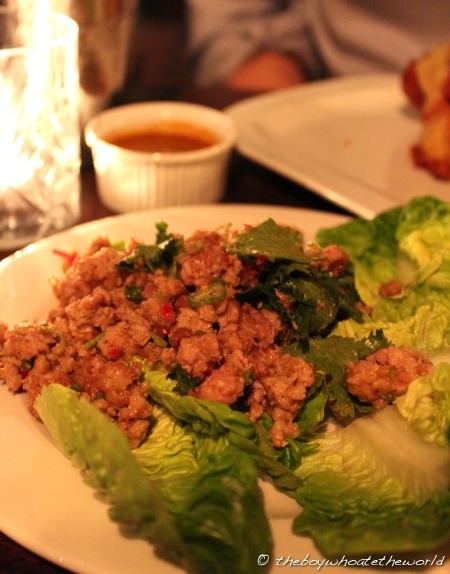 The juicy pork mince, spiked with fish sauce, lime juice, chillies and coriander had bombs of flavour… cradled beautifully by crunchy leaves of just picked little gem lettuce. 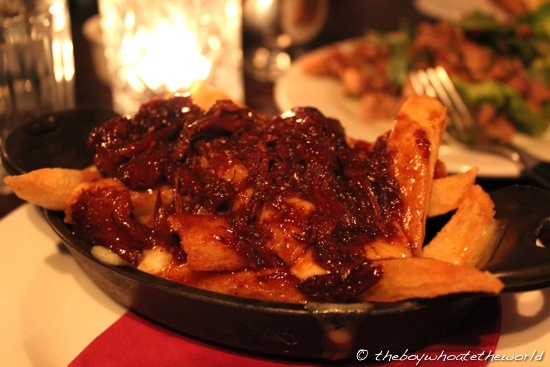 If there was one side dish we could have done without, it was the Ox-tail Poutine. Heavy and overly rich, the gravy soaked fries seem to get soggier and soggier with each bite, and the melted cheese and braised oxtail topping seemed to get stodgier and stodgier as it got cold. Regretfully, we would have been far happier with their bog-standard triple cooked chips. 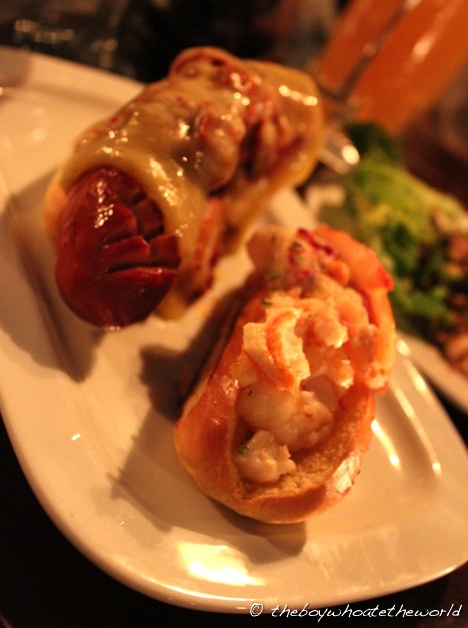 Onto the big boys – the Chilli Cheese Dog and the Lobster roll… both of which were served on duvet soft, toasty warm white rolls. The sausage was burstingly plump and ohsojuicy… the melted cheese, rich and oozey. If I had one gripe though, it was the scarcity of chilli. I was expecting lashings of it doused all over the dog and was left a little disappointed with the meagre bits here and there under the cheese. The Lobster Roll, though a tad steep at £15, was far more satisfying. With huge chunks of fresh, juicy-sweet lobster and a buttery sauce that was a cross between bearnaise and hollandaise, it was yummily reminiscent of the one (and only) other time I’ve ever had Lobster roll in New York several years ago. Damage on the whole came up to £80 for the 2 of us (including 3 cocktails). 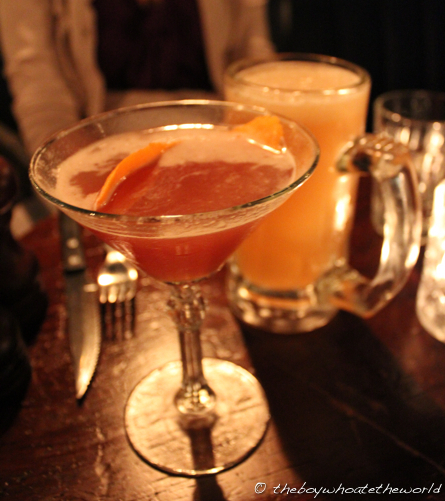 Yes, it’s a little dear for bar food… but in fairness we did go a little OTT, ordering much more than we could chew. Although service was warm and attentive on the whole, I wish they had staggered our food orders out a little more… I found some of our dishes had gotten a little cold by the time we got round to eating them. 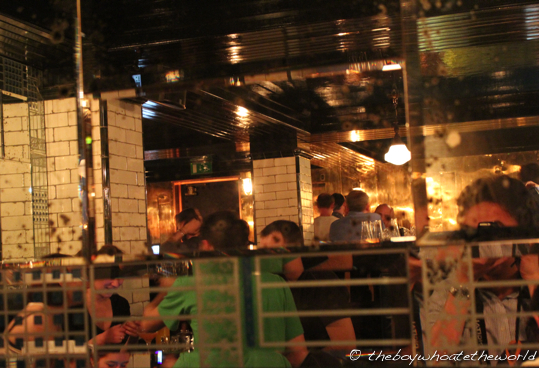 But with such a stonkingly good cocktail list and a collection of bar food that’s the stuff of fantasies, Hawksmoor’s new bar is just too much fun to not love. Yes, I’m still hurting from the demise of Brunch, but the gorgeous Short Rib Nuggets with Kim Chee ketchup certainly gives plenty of reason to forgive. Poutine?!?!? Amazing… I have been searching for a place that does it. The only others are the Canadian pub in Covent Garden and Gordon Ramsay’s at Royal Hospital Road. As it is a side dish at Gordon’s, the price of mains are a barrier to trying it. Looks like I will be giving this one a go sometime soon! Ram: I actually had no idea what it was until I asked. Think it has Canadian roots as you say… Def something that needs to be eaten piping hot, otherwise it becomes a little soggy and stodgy as it gets cold! Yeah, it’s Quebecois! 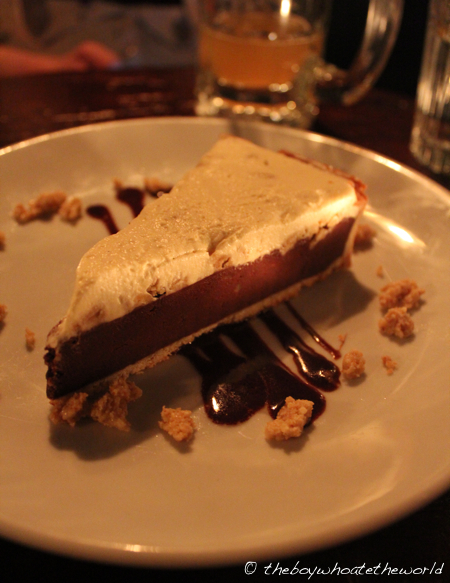 The version at the Maple Leaf pub is nasty – onion gravy is just wrong! Looking forward to try the version at Hawksmoor though…the extra toppings on top is very modern (well, to me at least…but it’s been done in Canada for a while). Su-Lin: The first bite of the Poutine while it was hot and the cheese all oozey was great. But all downhill from there if you ask me. 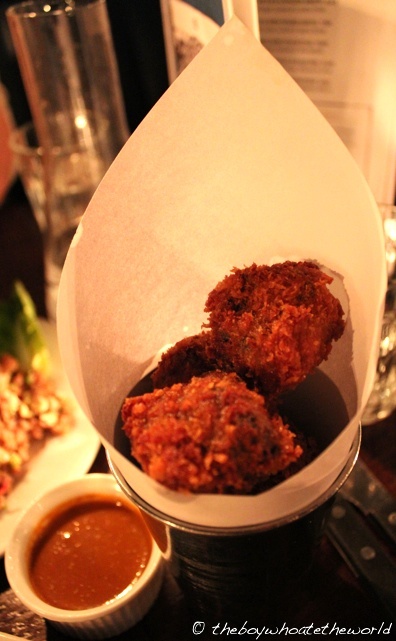 If you go drop by the bar, it’s all about the Shortrib Nuggets!! !